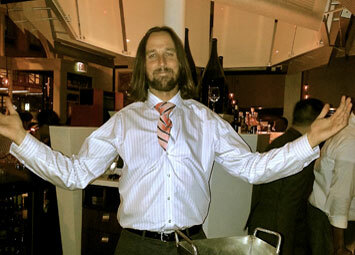 Home > Local Chef Spotlight > What would Champagne Jesus do? What would Champagne Jesus do? ChefIam.com: Tell us a little about yourself- how did you come to first work at Pops? MS: I first began working at Pops in 1997 after college. I came to Chicago to visit my sister for an extended vacation and was fortunate enough to get an interview with the owner Tom Verhey. If I remember correctly we spoke for about 2 minutes on wine, service, and the business before sports entered the conversation for the next hour. The rest is history! ChefIam.com: What is your favorite Champagne? MS: It’s difficult to choose a favorite champagne, much like selecting a favorite child. That being said, we all secretly have our preferences and Champagne Bollinger does such a top notch job on their entire catalogue that I have always leaned in their direction. From the NV to the heralded VVF I am always more than pleased when indulging on one of AY’s best. ChefIAm.com: When it comes to food, what is the ultimate pairing combination for you? MS: Being an oyster fanatic having grown up on the east coast it would be easy to say champagne and some East Beach Blondes or Watch Hill oysters are the ultimate however, I will take some crispy fried chicken and a nice clean crisp extra brut champagne. ChefIAm.com: What is the easiest way to choose a decent champagne in the liquor store? MS: The easiest way to choose champagne in your local wine store is simple. Do as I do when looking for a decent Riesling; ask for help! Your local wine merchant is there for a reason and it’s usually because they love wine so much they have devoted their life to drinking it. ChefIAm.com: You go to the liquor store and there is only cheap champagne. What would Champagne Jesus do??? MS: When I go to the store and the bubbly selection is lacking I have to say my next move is easy, I purchase my favorite Ketel One vodka, a bag of ice and insert glass! ChefIAm.com: What’s the best thing about your bar? MS: The best thing about Pops for champagne is a no brainer, the people. Pops has regular guests that live internationally such as, Switzerland or Amsterdam as well as all over the great United States; and I am lucky to interact with all of these different cultures and people on a daily basis. Champagne is a pretty amazing wine that has a very unique following and at Pops I get to experience all of that (hence the 16 plus years). Please say hello next time you are in Chicago and Sante’.